WaterBaby is a vitamin and nutrient enriched drink that is designed as an alternative for the many women who struggle to take traditional tablet form supplements during pregnancy due to morning sickness. I was really sick with my last pregnancy, so thought I would give it a try this time round, (even though I am not nearly so sick this time, thank goodness! It's a boy this time, last time was girl?) I also thought it was quite useful for me, because I can never remember if I have taken my tablet or not, (baby brain), whereas I can keep a bottle of this on my desk and sip it through the day! The drink doesn't contain the full list of vitamins and minerals that the tablets such as Pregnacare do, but it contains the essentials- for example, each bottle contains the recommended daily allowance (400mcg) of folic acid, which is essential for fetal spinal development, especially in the first few weeks of pregnancy. (Some of the other vits and minerals in the tablets are not available in soluble form which is one of the reasons they aren't included). Apparently though, it is safe to take a daily supplement additionally, if you can stomach it! Do check this with your midwife. The full vitamins contained are: niacin, pantothenic acid, vitamin B6, folic acid, biotin, vitamin B12, a mix designed to support embryonic development and to replenish nutrients robbed from you by your growing baby during pregnancy and breast-feeding!! WaterBaby is low calorie and contains only naturally occurring fruit sugars (sweetened with steviol glucosides, from the leaves of the stevia plant) and no artificial ingredients. 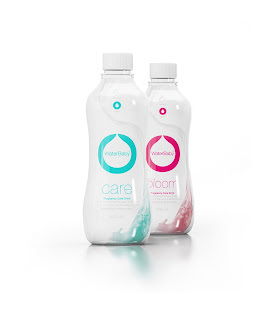 WaterBaby is suitable for pre-conception, pregnancy and breast-feeding. Tastes a bit like Volvic Touch of Fruit, or a weak squash, rather than water. Also the stevia gives it a teeny bitterness to the sweet after taste. I have been sipping it all day but the big 500ml bottle seems to last ages, as I can't drink large amounts like I would pure water. I think if I was feeling really sick it might take even longer. I definitely think it would be easier than swallowing and keeping down a tablet when sick though. Available in Citrus (Care) or Cranberry (Bloom) flavours.